Chinese car makers have come in for a lot of stick in their attempts to export to Europe. Quality, in general, remains at best suspect – and at worst, downright dangerous, judging by high-profile failed crash tests of Landwind and Brilliance cars. And then there's the issue of design piracy – a number of obvious copies of other automakers' cars have controversially been shown at shows, with some automakers mobilising their lawyers as a result. But the Geneva Show saw the European debut of the Chinese automaker that might just make a breakthrough. BYD is an automaker with a difference – it's the subsidiary of one of the world's largest battery manufacturers, and that could give it a crucial advantage in developing environmentally friendly vehicles. There are still some elements of the “bad old ways” of the Chinese auto industry – one of BYD's models at Geneva, the F1 city car, is a clear copy of the Toyota Aygo. But none of the cars on show will ever be sold outside China, said Henry Li, general manager of BYD's auto export trade division. Instead, special European models will be designed, with major input from European design consultancies. So while the China-market models on the BYD Geneva stand won't be sold in Europe, the technology under the skin will come here, especially the DM (dual-mode) hybrid system fitted to the Toyota Corolla-sized BYD F3 model. This combines hybrid and pure electric vehicle systems, with a 100km pure EV range. B and C segment cars are planned for Europe. The DM system also employs BYD's own Ferrous battery technology, which offers a “significant price advantage” over rival battery technologies such as Lithium Ion (Li-Ion) or Nickel Metal Hydride (NiMH). If there were any doubts about BYD's battery expertise, here are a couple of impressive statistics: BYD is the global number one supplier of Nickel Cadmium (NiCad) batteries for laptop computers, with a market share of around 65%, and it is the biggest supplier of Li-Ion batteries for mobile phones with a 35% share. 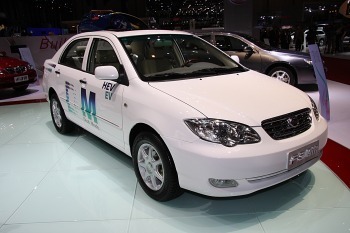 There's a good chance you're already a BYD customer!